When I originally started Big Hungry Shelby, one of the reasons I wanted to focus on Upstate New York restaurants is because, attending local pageants as part of my volunteering with the Miss America Organization, I get around to a lot of small towns in the state. This past weekend, I dragged Melinda with me to a pageant in Cortland, and she suggested a little spot in Homer for lunch, recommended to her by a BU professor who also is a reader. Dear reader – thank you for the tip, and I hope you speak up in the comments! Dasher’s Corner Pub is located on North Main St in Homer, which is just north of Cortland along Rt. 81, in case the drive from Binghamton to Syracuse is just too much for you without a stop to eat. And you know, if it is, I’m not going to judge you. I once knew this woman from Ireland, and she told me that her family’s big vacation ever year was to Dublin, which was a four hour drive from where they lived, and that they would pack a lunch to stop and eat along the way, because it was such a long drive. It made me giggle then, and it does now, as I travel between Binghamton and Watertown as if it were just a Wegmans run. Anyway! Dasher’s is charming inside, all dark wood and nautical notions. I loved the exposed beams in the ceiling, and the sort of shabby-chic nautical décor. Even more, I loved the fun 80s tunes playing overhead, but not drowning out our conversation. If I had to ding the pub on one thing, it would be that we froze our entire meal – the dining room was quite chilly. This seems to be a theme this winter, as if our restaurants just can’t keep up with the marathon winter we’re experiencing. There were four appetizers on the menu I really wanted, but since there were just us two, Melinda helped me narrow down to the beef carpaccio and the burratta and greens. She’s so good like that. The beef for the carpaccio was sliced ever-so-slightly thicker than I’ve had it before, but was just as buttery and tender as one would expect. It contrasted nicely with the peppery arugula, salty, snappy capers, the zing of drizzled Dijon mustard, and a very smart, light sprinkle of sea salt. Whomever thought to finish this plate with a sprinkle of salt was very wise in the ways of the kitchen. 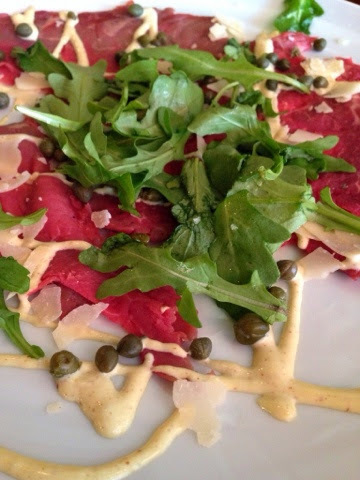 Total ninja move, which transformed this from a plate of sliced meat, greens, and mustard into carpaccio. The burratta and greens was another animal entirely – intensely bright and fresh on the front of the palate, with a deep spice kick in the back of throat thanks to the cherry peppers in the Utica greens. The midpoint of any given bite in your mouth was gorgeous, oozy creaminess from the cream center of the fried burratta cheese. 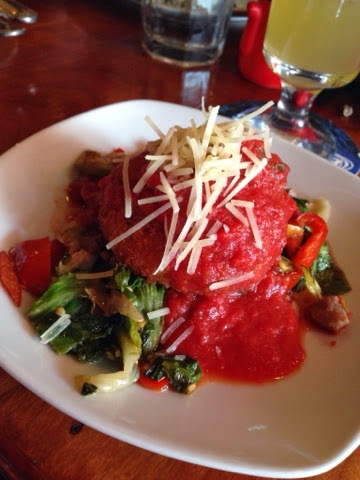 The tomato sauce that garnished the greens was so fresh tasting, I would bet that chef either makes it fresh per order, or cans his own garden grown tomatoes each summer. Splendid. I had decided before entering Dasher’s that I would be having a lobster roll for lunch, but once Melinda talked me out of getting the liver pate as an appetizer, there was a domino effect that led me to the Wellington sandwich as my entrée. Indeed, the pate was the brightest shining star on the plate, though the sliced prime rib was tender and uber juicy, the mushrooms were deep and earthy, and the sesame seed roll was light enough to soak up the jus but not enough of a sissy to fall to pieces. 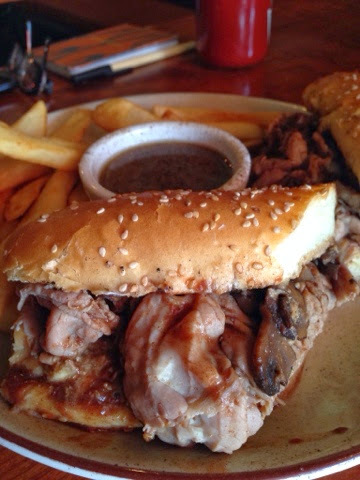 In order to imagine biting into this masterpiece, think of the best French dip sandwich you’ve had, perhaps Ithaca Ale House’s stunning rendition, but a little less salty, then add the minerally, salty funk of pate to that gorgeous mouthful. Yeah, I know, yummm. 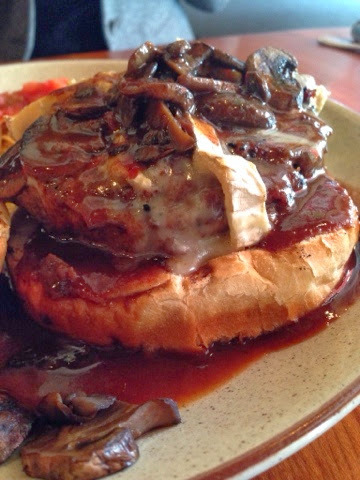 Melinda ordered the Napa Burger, a beef burger topped with red wine sauce, mushrooms and brie. It was gorgeous: earthy from the mushrooms, sweet from the sauce, and a bit of funky cheese flavor from the medium-bodied brie. This burger was bold and assertive, and I loved the great grilled flavor of the burger itself, which added a smoky, charred addition to the works. I’m on Weight Watchers, and I’ve done really well. But I’m still human, I’m still Shelby, and I have zero willpower, so we ordered dessert. All the desserts at Dasher’s are made in house, which always pleases me. 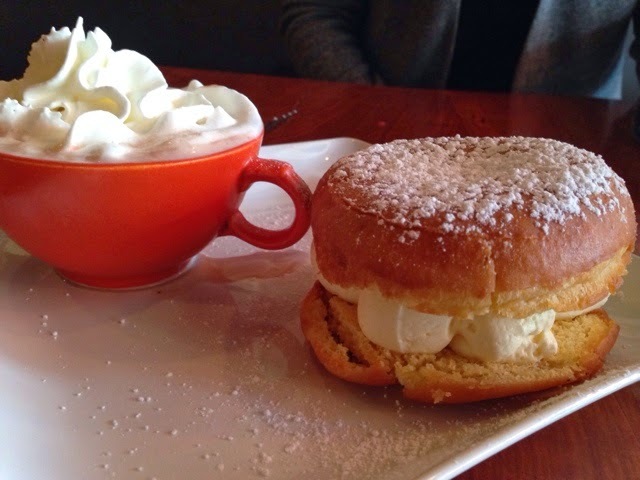 I would have been tempted by the profiteroles, but as I mentioned earlier, I was chilly our entire meal, so the custard-filled donut with a side of hot chocolate, for dipping, won. Melinda and I split it, because while we are greedy, we also are ladies. The custard on this mama was ultra sweet, with a thick, rich mouth feel that was still light enough not to be overwhelming. You could taste the butter in it, but you couldn’t taste only butter. The fried donut was crunchy on the outside and dense, but still somehow airy on the inside. I would say that the custard was stronger than the donut in flavor – I’m not sure I would have been as impressed with the donut alone. Dunking bites of that sucker in the whipped creamed-topped hot cocoa was the real deal. Melinda opined, “This is the best dessert I’ve had in a long time.” I agree, milady. We were excited enough about this place, that when we got to the pageant in Cortland right after our lunch, we recommended it to others, and it was the first thing I told my work friends about Monday morning. I mean, Homer is not exactly high on my punch list of places to visit, but its convenient, right-off-the-highway location makes this a really top notch choice if you’re motoring up or down the I-81 corridor. We gave it an eight on the BHS scale, and I might have been higher if I hadn’t been so cold all through lunch. When it’s 19 degrees outside, you gotta crank the heat, folks. Upon my return to Dasher’s Corner, I shall be sampling that lobster roll, the beet and goat cheese salad, and the liver pate as an appetizer. I wouldn’t mind also shoveling some truffle mac and cheese into my pie hole. And some pie, for good measure. You know how I do. 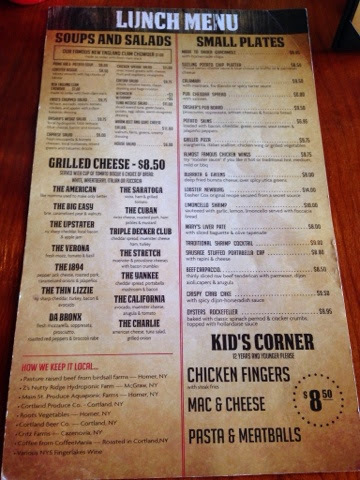 Take a look at the menu – what would you treat yourself to in Homer? My personality is big; my hunger is bigger! I would do the liver pate too! Next time I'm getting the lobster roll! don't forget about our delicious cocktails, my cucumber martini was light and crisp and your whiskey sour was to die for. I might have to go back and just have desserts too.